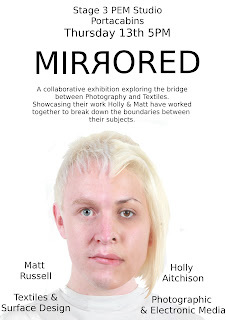 Above : Flyer for Exhibition, half Matt half Holly. 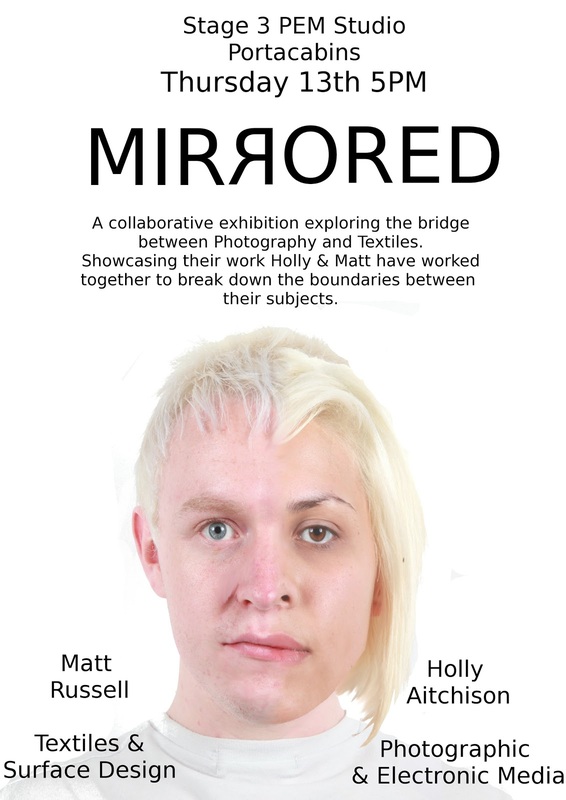 A Collaborative exhibition exploring the bridge between Photography and Textiles. I worked with my friend and Photography student Holly Aitchison to create a series of photographs and projections which explore the boundaries between textiles and photography. We worked with Textiles Prints and photographic research I used in projects previously along with Holly's photographic and digital media skills to make a combined set of projections. These projections then were projected onto each others torso and face, allowing the projection to interact and be manipulated by our positions and angle. Some of the projections really allowed myself to visualise in another manor how my prints could interact with the human form. These were then photographed in the photo studio in high quality, adjusted by ourselves then we shortlisted with photos we would use in the exhibition. After much thought and consideration the photographs were then printed digitally to the size of A1 (roughly the size of 8 A4 pages combined). The preparation of an exhibition was greatly underestimated by myself however it was certainly worth the work. Myself within a textile photo combination of stained glass window and a Tiger print. Holly within a photo I took in Shanghai with her Cat's eyes. Holly within the Tiger Beach. reception along with wine and nibbles. A few photos of the Opening night too below.